Design vs. UX Viral Photo — I Object! There’s a photo making the rounds in the User Experience world that’s gained thousands of favorites and retweets. You know the one — it shows nice, unused paved path next to a dirt path presumably worn into the grass by loads of people whose real goals were to get from point A to point B along a somewhat more desirable line. It originally came from Twitter user @benkimediyorum. And while I agree that what we’re looking at is Something vs. Something Else, and I believe I get the essence of what the photo is saying, I do not agree that we’re looking at Design vs. User Experience. Why? Because Design done properly reflects a well-planned user experience. The User Experience reflects a design created with the input of the users (in this case, the walkers), but also with the input of the business (perhaps this is a school? ), the constraints of the budget, the environment, and so on. Design and UX go hand in hand, and I don’t believe you can pit them against each other. If Design had been part of the project, it would have started out with some conversations. First, hypothetically, with the users. Anyway, my point is that some easy-to-do user research would have uncovered a lot of actionable information. Design’s role is also to understand the client’s goals, not just the end user goals. A roundtable discussion or 1-on-1 interviews with the business would have elucidated any constraints that the business had. Suppose the budget is finite and it’s not possible to pave two paths. What if the land adjacent to the proposed path is notoriously flood prone or is some kind of wildlife preserve. Now what? Now what is that Design — that ongoing conversation between user and client — would have come up with the best possible outcome, given the constraints of the client and the goals of the user. As a User Experience Design practitioner, I can tell you this: The best possible outcome is NOT always the ideal outcome for all parties. That’s reality. But Design — good Design — will always attempt to create the ideal User Experience. The two go hand-in-hand. All that said, for the sake of this Design vs. UX photo, let’s assume that the school had sufficient budget to create a paved path (or two) anywhere between the two points and that the land was not some kind of preserve or swamp. No major constraints, and the project developers were eager to just go out a make a path. The result? The photo you see. An expensive, non-Designed path alongside a worn dirt path representing what would have been a much better Designed path. A path that would have been created with much user input. A thoughtful, conversation-driven, researched, planned, studied, iterated, tested process that would have ultimately placed pavement where dirt now lies. What I see in the photo is not Design vs. User Experience. If we’re to infer that the paved path is the undesirable one, it is actually the antithesis of Design. The dirt path is what should have been the design had Design and UX been involved. 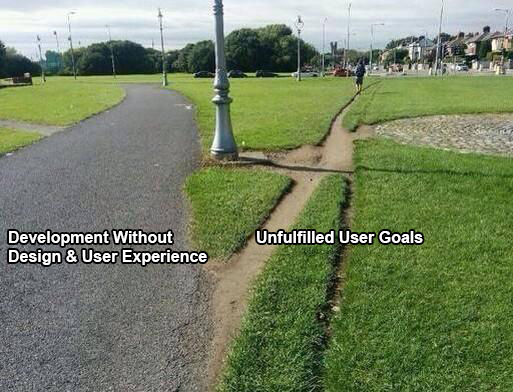 Using my mad Photoshop skills, I have recaptioned the photo: Development Without Design and Unfulfilled User Goals. The paved path is what happens when a project plows ahead without UX and Design. The dirt path represents unmet, undiscovered user goals and desires — the beginnings of a design unrealized. What’s scary is how often I see this in the corporate world of web sites and applications. Where a business unit says, “We need a web site that does blah.” And developers plow ahead, paving a web site that accomplishes their own aims, and leaving the poor users to trudge through the dirt to accomplish their goals. Redesigning Your Site to Be Responsive? You Need to Conduct Usability Testing. Often. 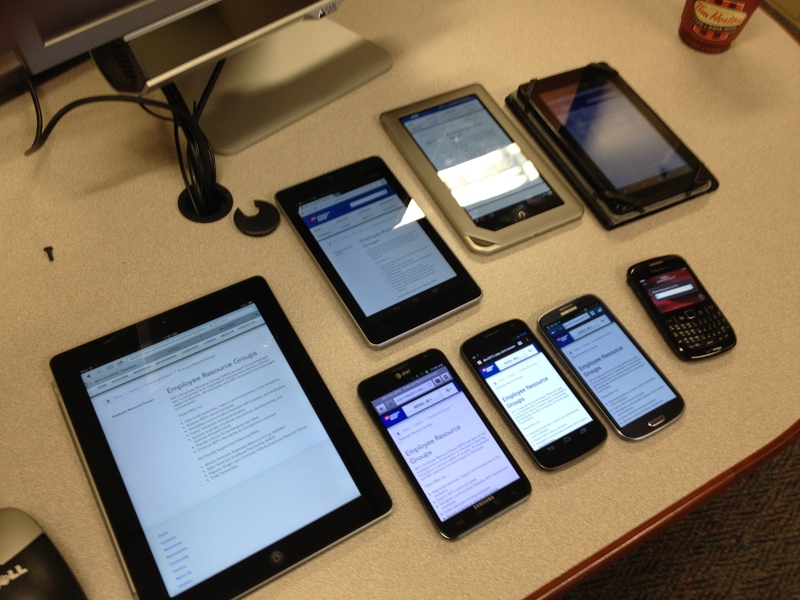 A vital component to our customer web site redesign at AEP is iterative usability testing. Our site is large – hundreds of pages, 7 sections, tons of content. Our analytics reveal that around 95% of our customer traffic is there to do one of 25 key tasks: view or pay their electric bill, report an outage or check outage status, or do some other account-related function. The other 5% of traffic is there to do anything else among our hundreds of pages. So, while our priority was to make the account-related functions prominent and easy to access, we couldn’t exactly kill all the other stuff. As our information architecture and designing commenced, it became immediately imperative to continuously run usability studies on our wireframes and design comps – to make sure our design decisions were solid and informed by customer failures and successes. We love the successes. But we rely on the failures to improve design. In this early design, too many users were clicking Contact Us, and not Report Outages & Problems. By the final iteration, we had created a design that worked and customers click on at least 85% of the time. But I shudder to think what the business impacts would have been had we NOT done usability testing. By consolidating the outage-related functions, the most recent design attracts most of the users to the Outages & Problems area. Another facet of our early testing was comparative usability testing, or A-B-C testing our site alongside 2 or 3 other electric utility sites. I cannot espouse the value of this enough. We gathered so much information about what works – and what does not work – in terms of design, labeling, and information architecture from our peer utilities. In many cases, our peers were vastly outperforming us in terms of consistency of where users clicked and how quickly they did so. From our comparative study — we saw how much faster our peer utilities were for paying your bill. Taking our wide, deep site, and making it responsive invariably means making design decisions that affect layout, navigation, menus, touch interactions, and all the other nuances of presenting a web site to a small viewport. Early on, we did a few rounds of in-person wireframe usability tests. At 320 pixels wide, the comps, when loaded on a test server, fit perfectly within the confines of an iPhone and certain Android phones. We experimented with various high-level elements, like the account login, search box, and navigation menu. A very early mobile wireframe. As our design became more refined, we began usability testing with full-color comps, created by our expert interaction designer, Nick Carron. Using Axure (wireframing software), I took Nick’s comps and created a pseudo-interactive experience. 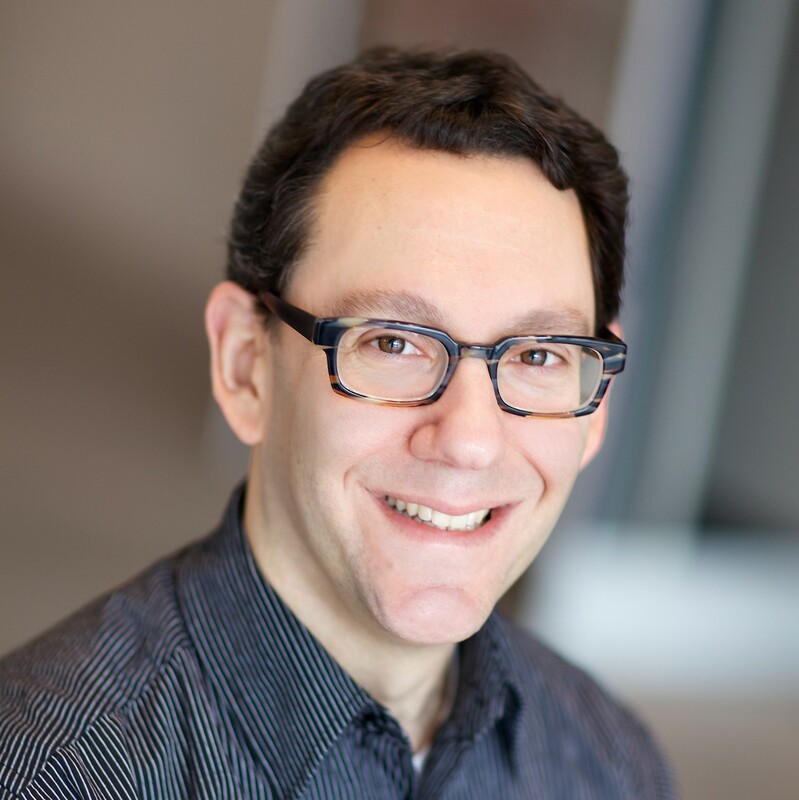 I then proceeded to conduct 5 remote, recorded mobile usability tests with representative users on iPhones and Android phones. Again, with each test, we patted ourselves for the successes. But lived for the failures. While we’ve seen several issues with navigation and other design elements along the way (which we’re addressing with each subsequent round of test-design-test), I’ll point out a couple of key failures – with icons. What I know is that on tasks that required users to access the hamburger icon, a larger-than-expected percentage of them scrolled down the page – and in many cases, all the way down to the footer – where they found an appropriate link to tap. Recent studies and articles have actually shown this ineffectiveness: Aurora Bedford, of the Nielsen Norman Group, wrote an article on icon usability. Jennifer Aldrich blogged about it in her “User Experience Rocks” blog. Exis did a quantitative study on it. Most users scrolled down — some all the way to the footer to find nav that was under the hamburger. 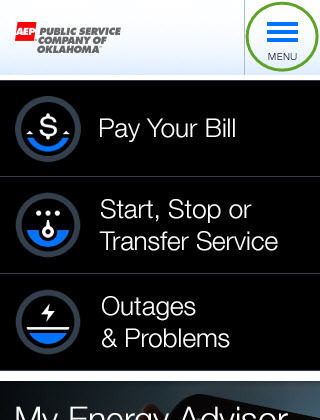 Simply adding the word “Menu” to the icon significantly improved the tapworthiness of it – although it’s much better at drawing in the Account-type functions than more general content like News or Save Energy. Adding “Menu” to the hamburger icon helped a great deal. But it’s still not perfect. The second icon failure was a simple [+] sign – which we used to show an expandable section on the page. Nope. People didn’t tap it. In fact, one person, who clearly saw it, commented that “plus means to add something, and that’s not what I want to do.” Duh. Oops. Using [+] for expandable content wasn’t intuitive. I live for those “duh” moments. The new design has a down arrow, but as of now, we still need to test its effectiveness. Users will scroll a long page, but will bail out as soon as they see a link that might be remotely connected with what they’re looking for (even if it’s not). Users are unforgiving about page load time on mobile — although slightly less unforgiving during a usability test. Users don’t read content. They quickly scan. Users will tap anything that looks like it could help them – even nonclickable headers. Users have really big fingers compared to the things they have to tap. Users learn your site during testing, so it’s best to re-order your tasks as you work through your list of participants. Users will say something was totally perfect after they struggled for 2 minutes trying to find it. If they say: “So far, everything is easy, no problems here” or “OK, perfect” – DO NOT BELIEVE THEM or use what they say to add to your insights. Instead, rely on your observations. Our next studies will be another mobile study, a desktop usability test (probably the first of 3 or 4), and an eye tracking study. In total, by the time the site launches late this fall, I expect we will have done more than a dozen in-person and remote usability studies – with input collected from more than 250 representative users. Have you gone responsive yet? What kinds of usability activities did you do? And what amazing DUH moments have you had? 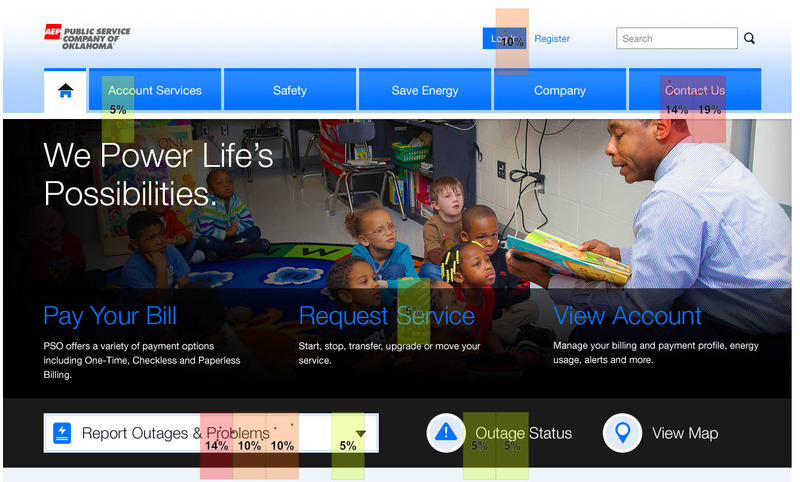 At AEP, we’re in the midst of a gigantic redesign of our corporate site, AEP.com. We’re developing the site using responsive design, which means our one design adapts to work on any device. We’ve already conducted at least 5 rounds of user experience testing already, in order to nail down the global navigation (how does it change from full desktop to iPad to small tablet to iPhone or Android phone), contextual navigation, dealing with long content pages, and other UI elements. 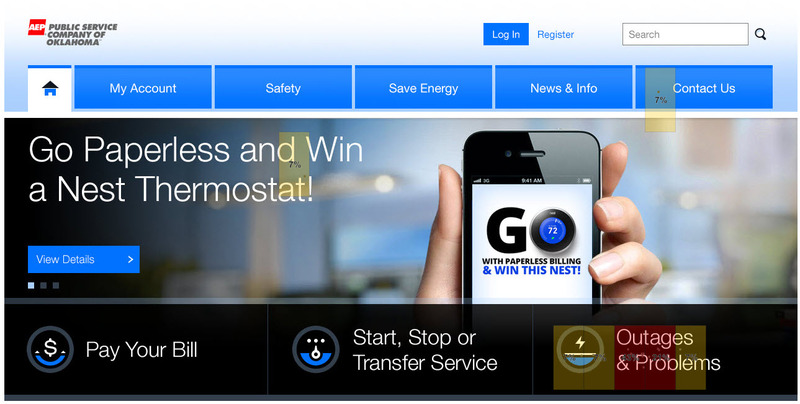 Now, with the site earnestly being developed, we prepare to bring in customers to test the full experience. The usability testing, which will begin next week, will have users complete common tasks that explore aspects of navigation (findability and context) of a deep site; readability of content on small devices; usability of tables containing lots of data; the usability of completing a form on a mobile device; getting customer service; general touchability and effectiveness of interaction design. Working with our outside recruiting firm, we’ve enlisted participants who are very mobile and internet savvy and who have experience looking at information on corporate sites. As of this writing, we will be testing on two iPhones, two iPads, two 7-inch e-Readers, one Android phone, and one 10-inch Android tablet. Our testing hardware will allow us to record both the mobile device screens and the picture-in-picture of the users’ faces. Because responsive design is meant to work on any device, we’ve invested in a bunch of mobile and desktop gadgets. Here are a few pictures of our gadget lab. Some of the gadgets in our lab. iOS devices, Android phones, e-Readers, even a BlackBerry. Another view of our gadgets. The Dell monitor on the right is our eyetracking equipment. 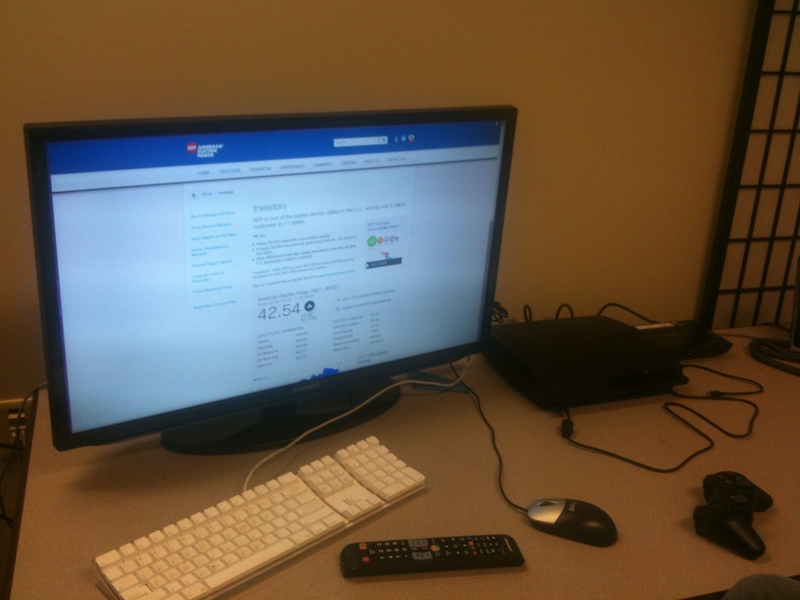 Viewing our site on a Samsung SmartTV. Also pictured are a Sony Playstation 3 and Google TV. 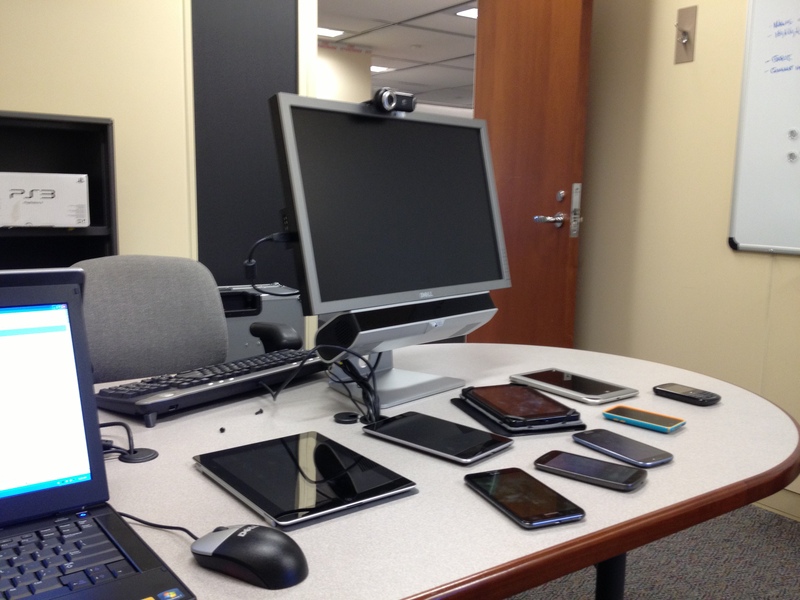 We keep the devices in the UX Lab, but we’re also using the room to do QA on the devices. Thus the room has taken on the moniker of QUAX Lab, which I find amusing given that many people think my name is “Eric Dux.” It also speaks to the general craziness we’re all feeling with this project. The following week after we test on the small gadgets, we’ll run another set of participants through the full site experience — using our eyetracking equipment. This will let us see exactly where people are looking as they traverse our site, providing excellent insight to our designers. And, of course, we’ll learn about how the navigate and complete tasks, and to what degree of satisfaction. Being part of a corporate responsive design project has been a significant learning experience for everyone in our group. It’s been a heck of a lot of work and we could probably write articles on content governance, iterative design and usability testing (aka, being agile), nuances of designing for breakpoints, structuring design and development teams, quality assurance, and so on. Our upcoming usability testing is one portion of a huge project — but an important one to validate that the site works for real people.